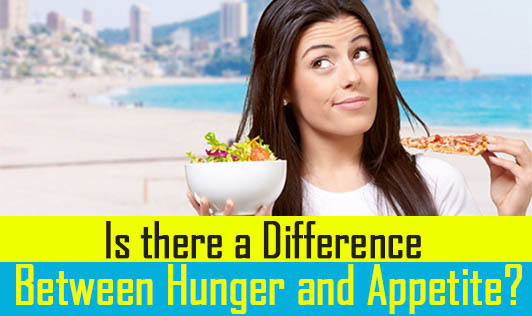 Is there a Difference between Hunger and Appetite? People often misuse the term hunger with appetite. The fact is appetite and hunger are two different terms defining two different signals of the body. The difference between the two terms is simple. If you have ‘desire' to eat or just wanting to eat, it is "appetite" and on the contrary, if you are in ‘need' of food and feel less energetic and have pangs in your stomach, you are "hungry". Our flexible stomach accepts food even if it is still in the process of digesting the food that we had in our previous meal and hence we often eat beyond our requirement. Increased appetite could be due to hypoglycemia, hyperthyroidism, PMS etc. An increased intake of foods high in sugar or fatty foods to curb increased appetite can lead to weight gain. So watch what you eat. Your body signals are your best weight watchers. Learn the difference between appetite and hunger to cut down on excess food intake. Condition your desire (appetite). If not, indulge in healthy eating (almonds, carrots etc) guilt-free!